This recipe for healthy oatmeal cookies was originally submitted by Rose from Woodbridge, Ontario Canada. It takes good old oatmeal cookies, which I absolutely love, and kicks up the nutrition with the addition of flax and by using whole wheat flour. Rose says: Oatmeal cookies are a comfort food from our childhood, but we can take this already healthier cookie and make it more healthy. 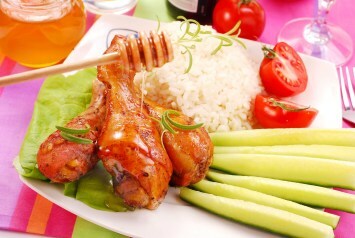 Check out my heart-healthy recipe! Add-ins: 1 cup of any of the following or a mix of the following: dried cranberries or other fruit, walnuts or any other nuts, trail mix, chocolate/butterscotch chips, etc. - or a 1 cup combination of any of the above for true "kitchen sink" style cookies. Preheat oven to 350ºF. Use parchment paper to line a cookie sheet. In a large bowl, beat canola oil with sugars until well incorporated. Beat in egg and vanilla extract. In another bowl, whisk together flour, oats, baking soda and flaxseed meal. Mix the dry ingredients into wet ingredients a little at a time, until incorporated but not over-mixed. Drop by the tablespoons onto the parchment lined cookie sheet. Bake for about 10 minutes, until edges are just starting to turn brown. Bake an extra minute or so for a crispier cookie. Let cool for 2 minutes. Makes 24 small cookies or 12 large ones. The recipe is easily doubled. 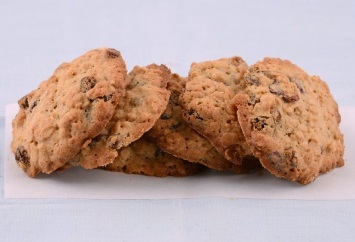 If you like these healthy oatmeal cookies, have a look at our oatmeal raisin cookes sweetened with sugar and applesauce.